When installing castor brackets kits on the 450 - the upper a arms bolts and pivot sleeves need to be modified to fit. This is something we do for you at no charge when buying one of our a arm kits. The rear suspension linkage has a very high progression ratio which causes harshness toward the bottom of the stroke. Our Econo link with take some of the progression out and is an excellent link for MX racing due to the smaller tires and the different needs for MX - it is also an excellent link for the trail rider who just wants to lower the quad and soften it. For the series racer we offer the Pro Dual Link that give an even greater progression change then we can achieve with one link and also offers a better leverage ratio. This link however requires a shorter shock then stock. 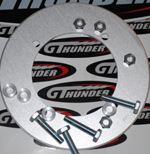 These have the gripper teeth and are lowered 1/2 inch from stock but still offer excellent ground clearance. Includes: Revalve, Respring, and Econo Link. Includes: Revalve, Respring, Pro Dual Link, and a new high flow piston. 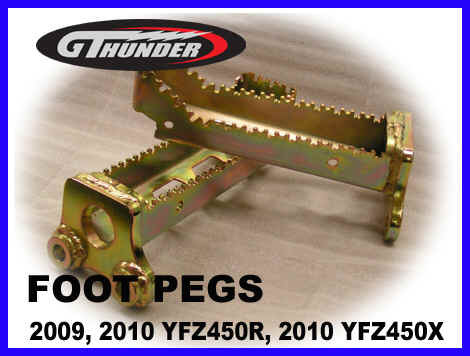 This is the front link - it is an excellent add on for the guy who wants to lower his quad and soften the rear shock with out spending a lot of money. This is a dual link and requires a different length shock but offers a better progression and leverage ratio curve vs. the Econo link. If we do your rear shock conversion - we modify your rear shock to accept this link. Please note: This link will not work with a stock rear shock that has not been modified by us. It will only be sold to existing customers who already have our shock conversion or as part of one of our shock conversions. This is a custom made piston from Wiseco that gives good combustion action without having a high compression ratio - it runs much cooler then many of the high compression pistons available for the quad. It is the same piston that the Yamaha's Factory riders were using in 2010 these riders included Thomas Brown, Bill Ballance, Donnie Ockerman, and Brandon Sommers, Taylor Kiser, and Walker Fowler. This Piston is available in both 95 and 96mm. These cams have the most average power of any cams I have tested. If you racing on the dyno only - dont buy these - they do not have as much peak power as a few others. This comes with a custom modified fuel curve for racing. This comes programmed for your quad. I need to know what exhaust, with or without air box lid, what cams, what piston, what type of riding, what altitude, and what fuel you are running.